First, the correction. 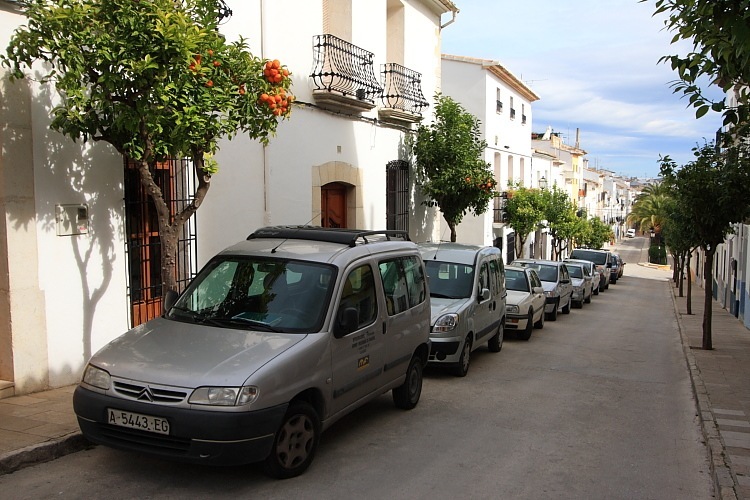 In "Jack and Jill" in this blog, I mentioned what I had been told was the “Plant” scheme in Spain for employment and revitalization. Whilst wandeting around Benissa, a few miles from where we were staying, we stumbled across another example of work being done under that scheme. Upon closer examination of the board proclaiming it, I realized our mistake. 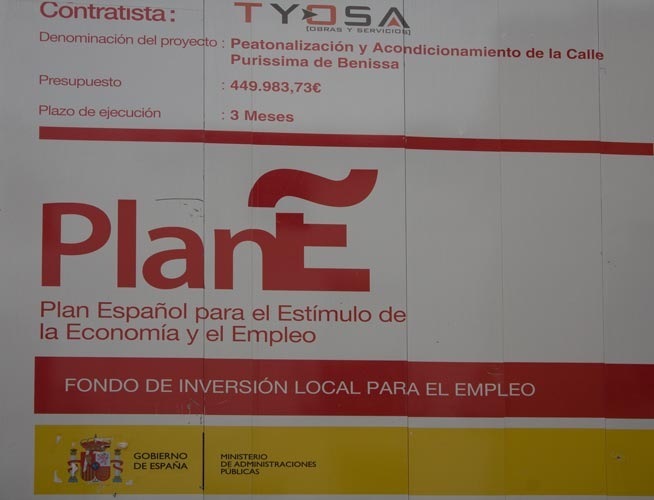 The scheme is actually called PlanE (Plan Espagnol"), which makes much more sense. On the left you can see the board. The in my view understandable misinterpretation is caused by the fact the the top bar of the “E” is stylized and has a disconnected top bar. Further more, the top bar is shaped like a tilde, the mark frequently used in Spanish across “ñ”, the so-called “enya” letter. So, misunderstanding corrected. While we’re at it, here’s a few pictures of Benissa that we snapped on our wander around. 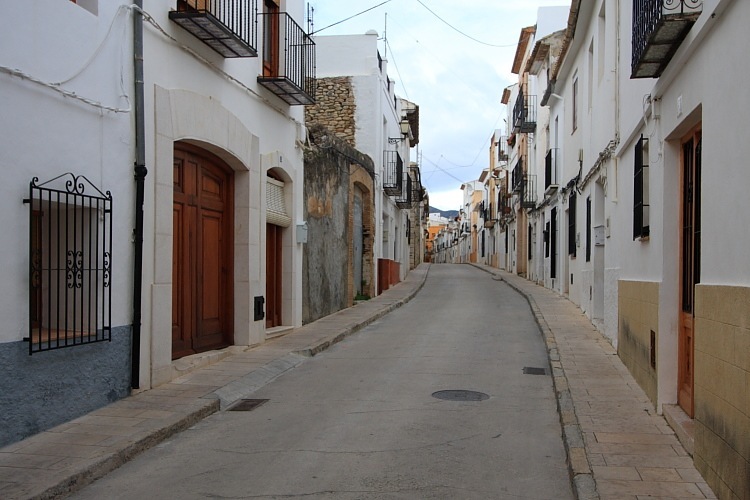 This was about the first time we’d been into Benissa on a day other than Market day (Saturday), so we coul dfind one particular street unencumbered by market stalls. 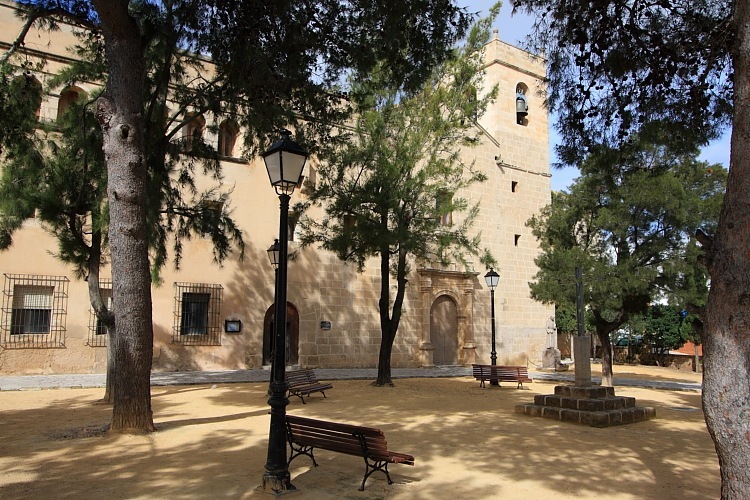 Benissa is one of our favourite towns in our very limited experience of Spain. Now to today. We dropped our car off at the airport and continued to be quite impressed by Victoria car rental. I hate renting cars and anything that smoothes the experience is naturally welcomed. Since everything was paid for up-front and all insurances were included, it was simply necessary to park and give back the keys. There was less bedlam at check-in than there was at Luton on our outbound leg, mercifully. As usual, in the hurry to remove shoes and belts at the security check, I managed to forget something, this time my mobile phone, and set off the security scanner. If it isn’t the mobile, it’s the iPod. Maybe it really would be better if we simply stripped naked and walked through. I popped into the “duty free” area and bought a couple of bottles of 103, my favourite Spanish brandy, and was surprised to see no bags. When I asked for one I was informed that they were available at a cost of 20c. What, 20c for a bag! Not having 20c, I carried my purchases to Carol, acquired 20c and returned for a valuable bag. Strewth, times in Spain really must be hard! Boarding the plane was bedlam again. Now armed with my bottles and additional “duty free” bag, I began wondering about the “one carry-on bag” rule. I wrapped them in my jacket and carried it. Discussing it with others, it seems that some had, indeed, been stopped because they now had too many bags. At £30 per hold bag, being allowed only one carry-on could soon start hitting duty-free sales and times in Spain will become even tougher. With hassle being added constantly, every time I fly I like it less. We were 25 minutes late leaving because of the boarding gate bedlam and a late incoming flight. However, the actual flight went well and, assisted by a strong tailwind, we made up most of our delay landing at Luton more or less on time. ‘T was a good trip but not a great one, though the company was excellent. The winter weather in Europe this year has just been worse than normal for everyone, it seems.